There’s a reason Rome and Venice are on just about every traveler to Italy’s bucket list. These cities are special and we love both of them for different reasons. If you’ve never been to Italy before, one or both should definitely have a place on your itinerary. But if you’ve been there and done that, Italy has a lot more to offer than La Città Eterna and La Serenissima (Rome and Venice’s Italian nicknames). We lived in Italy for seven years and when friends ask us where they should go and what they should do, these are the ones we tell them are the best places to visit in Italy. Once you reach Sorrento, the public transportation is practically non-existent. There are some regional train lines, but travel times can be really long and trains few and far between. That plays a big part in why Maratea, a gem situated just above a gorgeous stretch of coastline in Italy’s Basilicata region, is relatively quiet even in the high tourists season. It’s best to have a car if you’re going to travel around this part of Italy, but this coastline is empty of the honking tour buses and long lines of cars not-so-patiently waiting to reach the Amalfi Coast’s most famous towns. And you’ll be rewarded with beautiful beaches where you can find little stretches all to yourself. Getting There: Fly to Naples International Airport and then take the train to Maratea in 1 ¾ hours in summer. We really recommend renting a car to have the freedom to explore this beautiful part of southern Italy. Stay: The boutique luxury Hotel Santavenere has just 34 rooms uniquely decorated rooms and suites. With the best spa treatments we’ve ever had, an onsite restaurant, private stretch of beach just for hotel guests and a large pool, there’s plenty to do on property. 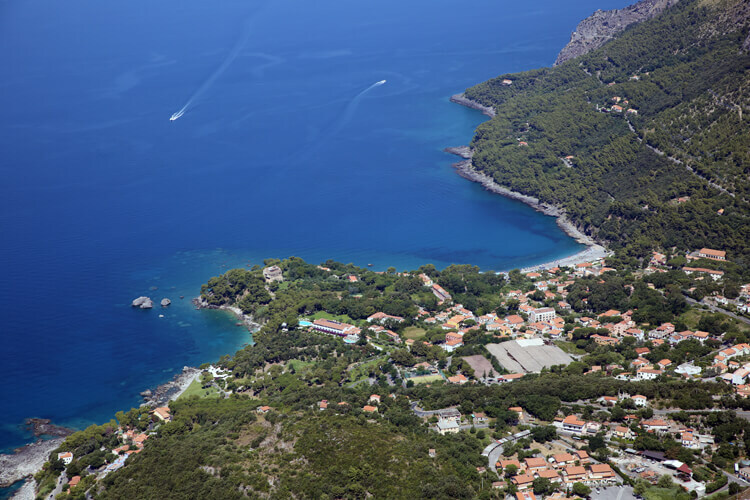 Maratea, Dino Island and the fifth largest Christ the Redeemer statue in the world are just a few of the attractions within the vicinity of the hotel. Stromboli isn’t just a delicious, cheesy type of pizza roll. It’s one of three of Italy’s active volcanoes and its been in nearly constant eruption for over 2000 years. Italy is home to the only active volcanoes on mainland Europe and you can trek on all three of them. 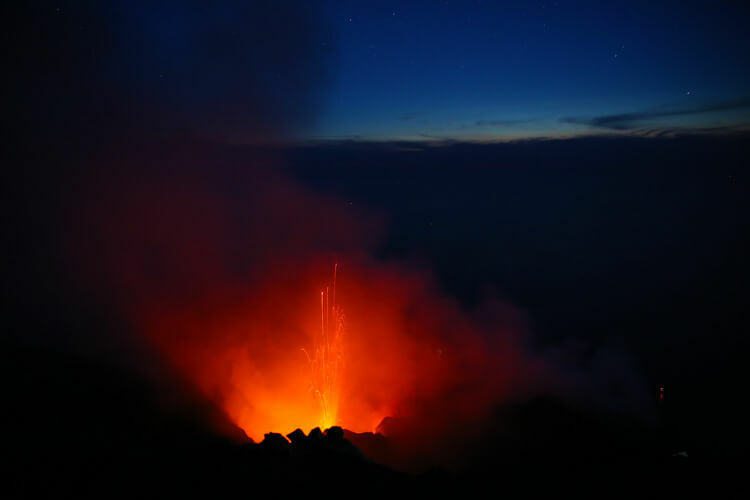 But you’re practically guaranteed a magical show like none you’ve seen before trekking up Stromboli, unless you’ve gotten up close with spewing lava somewhere else in the world. Getting There: Hop on the Siremar or Ustica ferry from Sicily to Stromboli in about 3 hours. Stay: The Hotel Ossidiana is conveniently located 100 meters from the port, which is great since Stromboli is a car free island and you’ll have to walk to your accommodation. The rooms are basic, but comfortable with excellent air conditioning. They also have a mini fridge, which you’ll want to make use of by stocking a midnight snack for when you’re starving after your trek up and late night trek back down the volcano. Ancient Rome is definitely a draw, but the Colosseum isn’t the oldest ancient ruin in Italy. Nope, it’s not Pompeii either. Not even close. Still not even the oldest, but getting pretty darn close are the ancient Greek temples still left for us to marvel at in Paestum. With hardly a handful of people even around, you’ll feel like you’ve stepped in to Athens – minus the hoards of tourists. 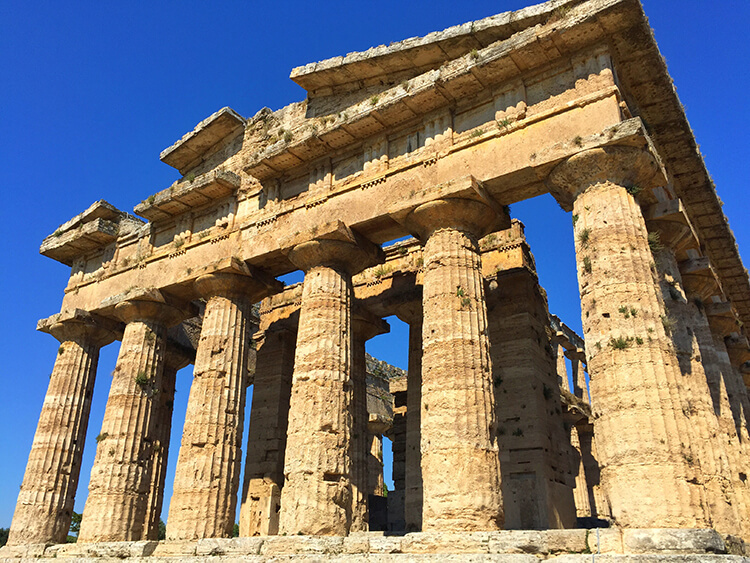 Paestum also mixes some of the best things in Italy: food, the beach and ancient history. Buffalo farms surround the ancient Greek site and this is where Italy’s delicious mozzarella di bufala comes from. You can visit some of these farms, like Barlotti where you can watch how the buffalo mozzarella is made and try some of the creamy cheese or buffalo milk gelato in their cafe. Cap off your time in Paestum on the miles of sandy beaches that are far less visited than those of the pebble beaches of the Amalfi Coast. Getting There: Arrive at Naples International Airport and then take the train to Paestum. If you want to visit the buffalo farms, you’ll want a rental car to easily get around the Cilento Coast. Stay: Since the Cilento Coast is much less known and visited than the neighboring Amalfi Coast, you can live it up in fairly luxurious accommodations for very reasonable prices. Oleandri Resort is just minutes from the ancient archeological site and has its own private beach for hotel guests. Merano lies in a basin surrounded by the towering mountains of Tyrol and the town is famous for being a spa town. Though Merano has been attracting European nobility for centuries with their therapeutic waters, we’d bet most Americans have never even heard of it. The mountains that hug Merano provide a mild micro-climate, and while you can quite literally feel like you’re baking in Rome or Venice in summer, the temperatures rarely exceed 80°F. It’s also a just right not-too-cold in winter with temperatures hardly ever dropping below freezing, yet there is good skiing very close by with shuttles running to the Merano 2000 ski resort. Merano wasn’t ceded to Italy until 1919, so there are very distinct German and Austrian influences here in the food, wine and even the spa culture. Getting There: Though Merano is in Italy, the closest international airport is actually Innsbruck in Austria at 158 kilometers away or Milan at 258 kilometers away. Bolzano is the closest domestic airport with flights arriving from within Italy and some European countries. Merano does have a train station if you prefer not to rent a car, though we recommend a rental car for exploring this little part of Italy. Stay: You’ll find one of the best boutique hotels in the world just above Merano. Miramonti Boutique Hotel is run by the husband and wife team, Klaus and Carmen. Miramonti was founded out of their love story and they’re always about to personally welcome guests. You truly won’t find a more chic and welcoming boutique hotel, not to mention the incredible views and unique glass enclosed Panorama restaurant. Of course, being in a town famous for its spas, Miramonti Boutique Hotel has its own spa complete with a forest sauna. Travelers often flock to Tuscany for the iconic rolling hills and wine. And while Tuscany is indeed beautiful, it’s actually much more lush with fields and green hillsides than vineyard after vineyard. For vineyard views as far as the eye can see, I’ve traversed the entirety of Italy and it’s the Veneto’s Prosecco Road that takes my breath away. 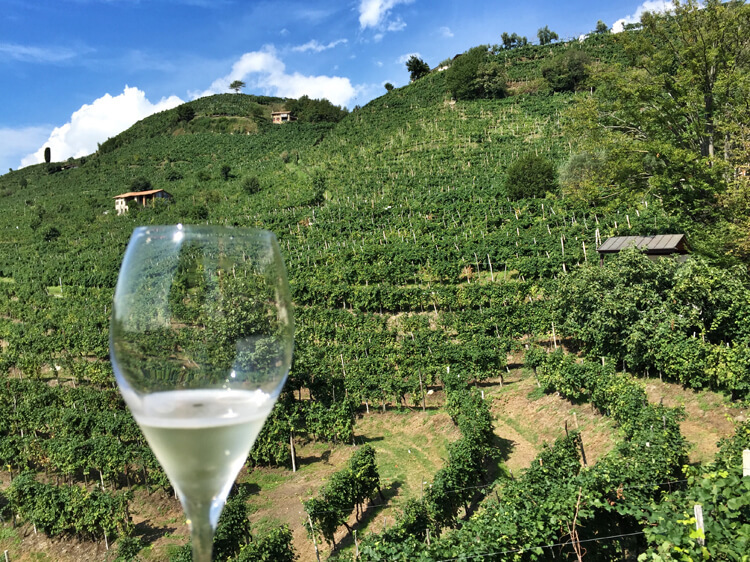 Here the vines climb the terraced hillsides and the grapes growing on the highest Cartizze hill become Italy’s best Prosecco. Though The Prosecco Road is just a stone’s throw from Venice, one of Italy’s most visited cities, you’ll find yourself traveling from winery to winery practically by yourself even in the height of tourist season. The lack of public transportation running through this delightful wine area make it an off-the-beaten-path destination, though we think it shouldn’t be missed. Getting There: Arrive at Venice’s Marco Polo Airport, where you’ll definitely want to rent a car to properly explore The Prosecco Road. Stay: The agriturismo is where we feel like you experience the real Italy. These small family-run working farms offer luxurious accommodations, some of the most incredible food you’ll have in all of Italy and you’ll leave feeling like you just gained a new family. Literally meaning beautiful view, Agriturismo Relais Dolce Vista has just five rooms, but all have breathtaking views of the Cartizze vineyards. There’s even a gorgeous pool perfect for taking the edge off the infamously hot Italian summers. Calling all the car lovers! Emilia-Romagna is home to the factories that produce all of Italy’s supercars – Ferrari, Lamborghini, Maserati and Alfa Romeo and Bologna makes a great base for an exhilarating trip getting behind the wheel of those supercars to see what they can truly do. 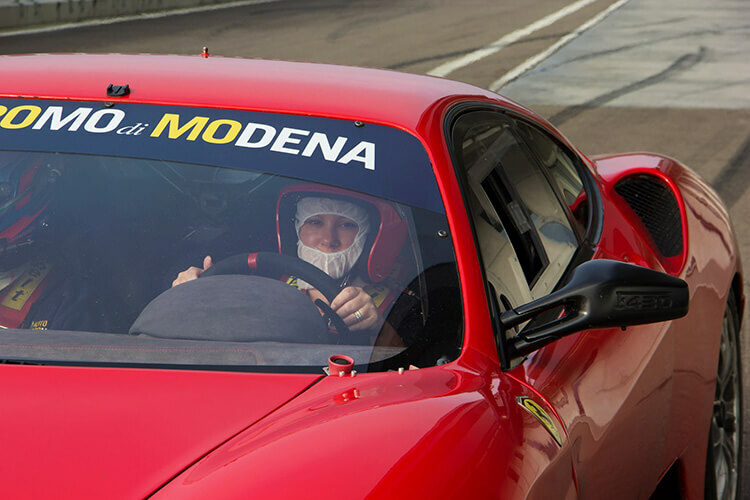 Much to Tim’s dismay, I spent two weeks in what I dubbed race car driver boot camp learning to use paddle shifters and pushing Ferrari and Alfa Romeo race cars to their limits on the tracks at Autodromo di Modena and Autodromo Riccardo Paletti. In between racing around the tracks, Emilia-Romagna is Italy’s foodie capital. It’s here that the famous Bolognese, or simply called “ragu,” was invented. You can certainly have a mix of heart pumping and foodie adventures in Bologna. Getting There: Bologna has an international airport. Much of Emilia-Romagna is very well connected by trains and buses, so renting a car isn’t essential. Stay: Art Hotel Novecento is located in the heart of Bologna convenient to great restaurants, sights and activities and public transportation. It’s affordable luxury right in the city, making it an excellent base for exploring further afield in Emilia-Romagna. Alberobello and its trulli are truly unique! Whitewashed beehive shaped buildings characterize this town in the instep of Italy’s boot. And though the Greeks, Spartans, Normans, Spanish and Swabians all had a hand in the history of Puglia, no one knows the history of the strangely shaped trulli. Alberobello is an even more mystical sight when the trulli are lit up each summer for the annual Alberobello Light Festival. 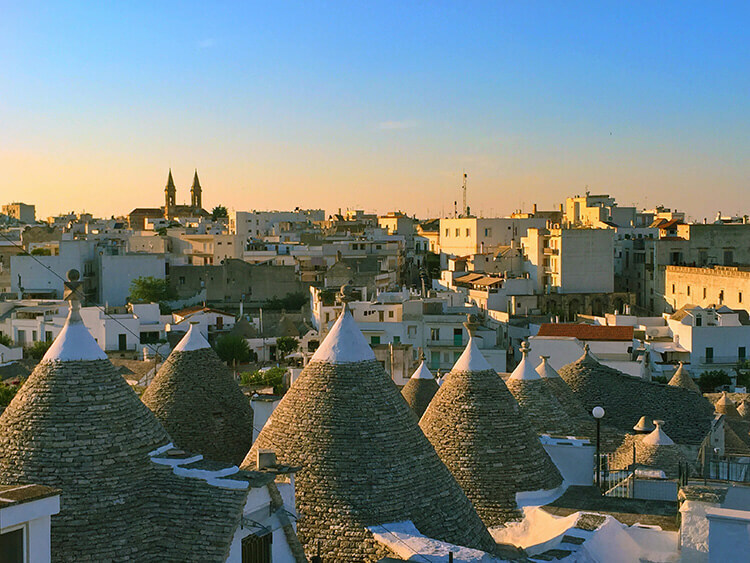 Aside from eating in, shopping in and even staying in Alberobello’s cone shaped buildings, Puglia is a delicious wine region. The sun-baked vineyards of this southern Italian wine region produce bombastic jammy wines with flavors of ripe figs and baked blackberries. Puglia’s Primitivo, made from the same grape as California’s zinfadel, is actually one of my favorite Italian wines. Getting There: International flights arrive in Bari and you’re definitely going to want to rent a car. Public transportation leaves a lot to be desired anywhere south of Naples, where Italy’s high speed train service ends. There are regional trains that service this part of Italy, but they are slow. The good news is that Italy’s tolls also end once you reach Salerno, so you don’t have to worry about the extra expense of toll roads while exploring Alberobello and Puglia. Stay: For a trulli, er truly memorable stay, book a trulli room at the Nina Trulli Resort just 10 kilometers from Alberobello. It’s a bit like staying in a luxurious stone cave but you’ll be hard-pressed to find such a unique hotel. There’s a pool, which is essential for refreshing dips to manage the hot, dry summers here. Just 75 miles north of Rome, there’s a town where the resident’s houses literally fall off the edge of a cliff. It’s Civita di Bagnoregio, nicknamed Italy’s dying town because the volcanic plateau the town teeters on is crumbling beneath it. The threat of this town ceasing to even exist at all caused the World Monuments Fund to place it on their Watch List of the 100 Most Endangered Sites back in 2006. Still, 15 determined residents live there year round and the small entry fee to visit go toward reinforcing the town so it can continue to live on. The attraction here is Civita di Bagnoregio and there really isn’t anything to do but wander, enjoy a meal in one of the small cafes or restaurants and appreciate that you’re in a place that one day will cease to exist. But there’s plenty more to see and do nearby, like Bomarzo Monster Park and Viterbo. Getting There: Rome is the closest international airport and you can take a train to Orvieto, then a bus to Civita di Bagnoregio. But you might detect a theme since we recommend it’s best reached with a rental car. There’s multiple car parks, and then the only way in and out is via the 1 kilometer long bridge crossing the Tiber Valley to the town. Stay: There’s a beautiful 18th century villa built and once owned by the very Prada family that makes high fashion. Villa Farinella makes a lovely base just outside of Viterbo for exploring Civita di Bagnoregio and the area. Note that this villa doesn’t have air conditioning, but even in a heat wave it was a comfortable stay. Everyone flocks to Lake Como, but the famous Italian lake has a neighbor that we think is even more beautiful than Como and its villages. It’s Lake Maggiore with its Borromean islands dotting it. I first visited here on a trip to Italy in 2006 and immediately fell in love. I could understand why a 19 year old Ernest Hemingway did to. When he visited Lake Maggiore’s Stresa after being hospitalized in Milan during WWI, he decided to take up residence in room 106 of the Hotel des Iles Borromees. The beauty of the lake and his own love story with the nurse that cared for him inspired much of A Farewell to Arms. If you’re a literary buff, grab a copy and read it as you experience ferrying out to the palace on Isola Bella or the botanical gardens on Isola Madre. And you won’t want to miss a lunch of fresh fish like lake trout on Isola Pescatore, named for the fisherman that take up residence there. Getting There: You’ll land at Milan–Malpensa and you can easily take a train to Stresa. The Borromean Islands are easily reached with a ferry that shuttles between Stresa and the three islands. You can even take a cable car from town up the mountain for spectacular vistas over the lake and islands. Stay: Hemingway returned to Stresa often throughout his life and room 106 at the Hotel des Iles Borromees is The Hemingway Suite. Even if you don’t stay in Hemingway’s suite, the hotel is beautifully positioned on the lapping shore of the lake and in the heart of Stresa. This one is for the adventurers looking for a challenge and some of the most beautiful mountain views you’ll find in Italy. It’s the Alta Via 1, a long-distance hiking trail that runs through the Italian Dolomites for about 90 miles almost to the Austrian border. There’s a short period in just July and August that the conditions are suitable. Sections of this hike take you through all sorts of terrain including rock, sand, boulders, mud, cliffs and snow chutes. There’s even opportunity to tackle some via ferratas, the old steel cables troops originally attached to the steep cliff faces in these mountains during WWI. Nights are spent in rifugios with good, hot meals. If you tackle the Alta Via 1, you’ll definitely have a trip to Italy unlike most. Getting There: Arrive in Italy at Venice’s Marco Polo Airport and take the train to Belluno. You can catch a bus from Belluno to near the trail head and a train or bus back. We don’t recommend leaving a rental car just parked as you’ll be hiking for about 12 days. Stay: Rifugios typically only accommodate a small number of hikers. You can’t pitch a tent, so be sure to book your rifugios in advance. You can find information and location for the rifugios on the Dolomiti Rifugio Website. The picture of the Dolomite captures the true essence of the area. Definitely one of most favorite places on the planet. Luxadventuretraveler does a great job telling people what’s beyond the usual tourist attractions. Keep up the good work. Wow, great places! I am a little Italy fan, but have been to only one of your places in this list. So, more for my bucket list again 🙂 Sirmione or other places around Lago di Garda are amazing as well! We always felt Sirmione was a bit too packed with tourists and the prices were over inflated, but there are definitely some other beautiful smaller and less known villages around Lake Garda. I’ve only visited Italy twice, once skiing and once to Sicily, I love the food, people, building and the scenery. Its next on my list when I am in Europe again! That’s pretty awesome! Usually most people’s first visit to Italy is to Rome. We have been to Italy but are yet to still cover many beautiful places out there. The Stromboli volcano looks spectacular! Those whitewashed beehive shaped buildings in Alberobello are simply very cute. Last but not the least, the mountain views of Alta Via 1 are so much like the ones we saw on our way from Switzerland to Venice. Its beautiful! What an amazing list. Been to Italy and did all the touristy stuff but this is just so offbeat! So many places that I had not heard of! Veneto looks spectacular with all its adventurous hikes and the racing circuit. Been to Modena and it’s Ferrari world, loved the way to Modena from San gimignano . Just too scenic ! I love how many of these places in Italy I’ve never even heard of. Last year I spent about a month traveling around and in your entire list, the only place I went to was Emilia-Romana (but we were in Modena, not Bologna). It just goes to show how insane Italy is, when my list of top 20 Italian destinations don’t include your 10. It’s the best! Italy is such a small country but incredibly packed with rich sights everywhere. We have covered quite a few towns – large and small over two-week vacations twice, but still feel quite a few return trips are in order. I’m ashamed to say how few of these I knew about before reading this post. I truly can’t believe how rich in culture and heritage Italy is. There are so many things to see! I was just learning about the Prosecco trail last week. We’re definitely going. Fabulous selection of cities to visit in Italy, of which I have been to exactly zero. I would pick the Prosecco area so I could drink my way through the beautiful countryside. They all appeared to have something unique and enjoyable. Thanks for sharing. This is such a great list! Italy is my favorite country and I usually visit it 3 times a year and I have only been to 2 of the places on your list. I will save this list for my next trip. Thanks for sharing! I’ve only visited Italy once, but I want to return in the near future. It’s such a spectacular country. In particular, Alberobello has been on my bucket list for ages, so I was super excited to see it featured in this post! I like to think I’ve travelled throughout a lot of Italy, we spent 3 weeks exploring by train, though I haven’t made it to any of these locations yet! I guess I didn’t stray too far from the tourist trail! Would love to visit Alberobello especially – it looks unlike anything I’ve ever seen!